Naturevape are excited to offer the latest RTA from NewGen Vape, the Meson RTA Tank Atomizer. The Meson RTA was designed for flavour by a new and exciting company who are based in Australia, their philosophy is that anything is possible with constant innovation and their products will only be launched once they are completely satisfied they have created something amazing. The NewGen Meson RTA features a 24mm diameter and benefits from the smoothest airflow we have tried to date. The Meson RTA has a top fill system which is capable of holding up to 2ml of e-liquid and 4ml with the provided bubble glass. The Meson RTA boasts an 18 hole honeycomb airflow system and a staggered two post dual coil deck for easy coil installation. 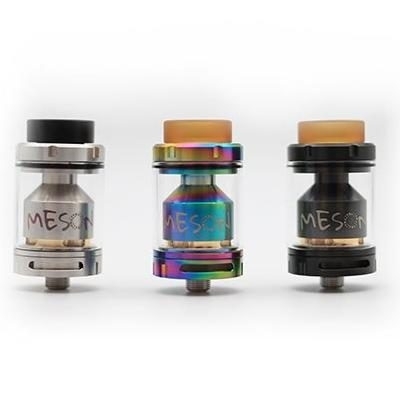 In summary the Meson RTA has intense flavour and having trialled this RTA we are excited by its all round design and performance.